He made the tough decisions in Grosse Pointe Blank. He couldn't be bought in Eight Men Out. He's cooler than John Malkovich. And we like his politics so far. Ultimately, after the effort received some favorable press coverage, Cusack pulled the plug on the idea. The last version of the campaign website noted: "The word has come down from the Big Guy that he wishes that this campaign would stop —and we must respect these wishes." 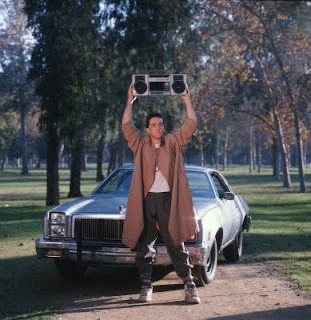 You can review the original media coverage of the draft Cusack campaign here, here, here, here, and here. As for Carol, you can see his LinkedIn profile to see his political resume. 1. 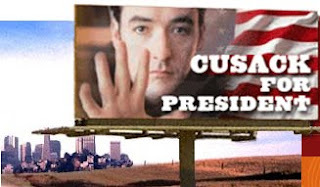 How did you come up with the idea for Cusack for President in 2002? Who designed the site and led the movement besides yourself? We had what I thought was a pretty innovative citizen engagement web site called Junction-City.com (now defunct) that we saw as a proving ground for different forms of creative online engagement, on issues and causes. In the summer of 2001, we decided to launch a celebrity for president campaign to reach out to young people turned off by party politics as usual. We thought about a bunch of folks, from Little Steven Van Zandt to Bruce Springsteen to Cameron Diaz, but Cusack's integrity, authenticity and "everyman" quality seemed like the right call at the time. It sure hit a chord. "We" was myself and the wonderful creative team at my cause consulting company. 2. What was Cusack's response? Did he ultimately ask you to stop the movement and website? How did you learn that? As the effort took off on campuses and the entertainment press, we were contacted by a PR agency that was promoting one of Cusack's movies who asked us to blast out list about the movie. We took this as a tacit sign of support. Then when we expanded the site to include more campus organizing tools in early 2002, we got a clear go-ahead from folks in his camp that it was OK as long as we weren't raising funds. Later as Mr Cusack kept getting peppered with questions on the campaign, and because of the seriousness of choosing a president became clear in the 2002-2003 run-up to the Iraq war, we were asked quite understandably to close it down. Which we did. Lots of folks saw the campaign as one of the important proving grounds for chapter-based online organizing efforts later used by the Dean campaign and MoveOn efforts, and for the Draft Wesley Clark campaign. 3. What did you think of Stephen Colbert's brief run for the presidency? I LOVE Stephen Colbert and think he is brilliant. I didn't love his presidential run. 4. Did you think about starting the Cusack site again in 2008? No way. I am busy with my work on smart forms of US energy independence. Plus the ball is in his court, not mine. I would say this: I think past draft campaigns like this -- whether imaginary like the movie Meet John Doe (Frank Capra, 1939), tongue-in-cheek like Pat Paulsen (1968), somewhere in between (Cusack 2001) or fully serious (Perot 1992, Bloomberg 2008?) -- reflect voter demand for something more than what they are getting from the usual candidates. In some measure, I think some of the current presidential field are reaching out to these deeper aspirations, but the proof will be in the pudding and if we end up with a lot of voters who are "bored" with early nominations in March 2008, I wouldn't be surprised if something popped up here. But we are in two shooting wars now, so this type of insurgent-creative challenge better be serious if it expects to get authentic and meaningful support.